Living with strangers (or even friends) can be trying at times. Any seasoned home-sharer will tell you: sharing isn’t always caring. Tenuous sharing arrangements have been known to destroy otherwise firm friendships. When it comes to keeping the space clean, everyone seems to have different standards, expectations and pet peeves. If you feel like your flatmates aren’t pulling their weight around the house, don’t let the resentment build up until you reach the point where you are irritated by every little thing that they do. Don’t turn into the clean freak that everybody loves to hate. Save yourself the stress. By adopting these simple and effective tactics, you can keep your common spaces neat, and also keep the peace. Before a messy flatmate turns into an enemy, remember: communication is your best friend. And by communication, I don’t mean passive aggressive notes surreptitiously pinned to your roomies door in the middle of the night. I mean good old-fashioned conversation. When you live in a shared space, don’t assume that your idea of ‘clean and tidy’ is universal. What’s acceptable to one person may not be enough for another. The soap scum in the shower that drives your flatmate crazy might not bother you. And the clutter on the coffee table that infuriates you might not faze them at all. It’s important to be upfront from the beginning. Ideally, start the conversation before you move in together. Compare your cleaning habits and expectations, and then negotiate a mutual standard that works for both of you. If you already live in a share situation with no plan for keeping the house tidy, start talking. Don’t wait for cleaning to become a problem. Once the topic is on the table, draw up a cleaning roster that meets everyone’s expectations and suits your schedules. Identify your main cleaning goals and make sure that they are clearly prioritised on the roster. Are you nifty with a scrubbing brush but useless with a mop? There will be some chores that you enjoy doing more than others. Make sure that the roster reflects each flatmate’s strengths and partialities. The roster should map out most of the light cleaning tasks, like vacuuming and washing the dishes. It doesn’t have to be enforced with boot camp rigour – it’s more of a general guideline to create healthy routine and keep you on track. Leave big tasks (like cleaning the oven or the windows) for a designated cleanup day, where all flatmates lend a hand. Sharing the workload takes the dread out of heavy cleaning and builds camaraderie between flatmates. Make a day of it. Pop an upbeat soundtrack on the stereo and reward yourselves with beer and pizza (or champagne and oysters, if you prefer) once the hard yards are done. If you are time poor, you might find it more convenient for everyone to chip in for a cleaner once a month. Sharing a house or apartment is an economic necessity for most, so hiring a cleaner may sound like a luxury. 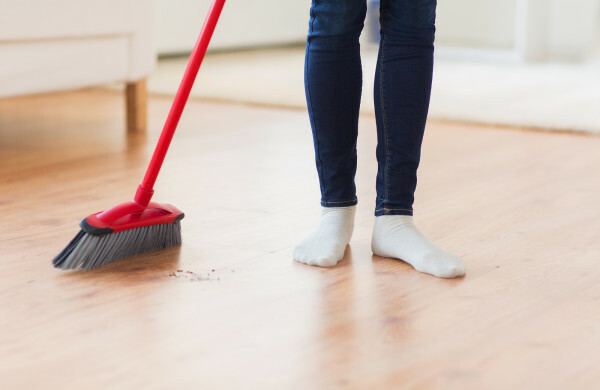 But if you are pooling resources, the expense is quite affordable – especially when you think about the money that you will save on cleaning products. A site such as Airtasker may help you find trusted cleaning services in your local area. Katie is a Sydney based blogger, digital marketing specialist and community manager for Airtasker, a community based marketplace. Katie is a great cook and also enjoys interior design, especially DIY. Living next to the beach, she's always there (on weekends) swimming, catching up with friends or volunteering as a lifesaver.